The positive turnaround in South Africa’s new vehicle sales continued in September, according to the latest aggregate sales data from the National Automobile Association of South Africa. A total of 50 322 new vehicles were sold across all segments, last month, representing year-on-year sales growth of 6.3%. Data indicates that consumer buying patterns were responsible for the positive performance, over the past month. The dealer channel, where consumers are active, saw overall growth of 6.3%. Within the dealer channel, passenger car sales volumes grew 10.3% while sales of light commercial vehicles (LCVs) rose 5.3%. WesBank’s data points to value for money as the sales driver behind September’s sales performance. Average deal values for new vehicles are in decline. While new vehicle price inflation has slowed, the vehicles prices have not declined. 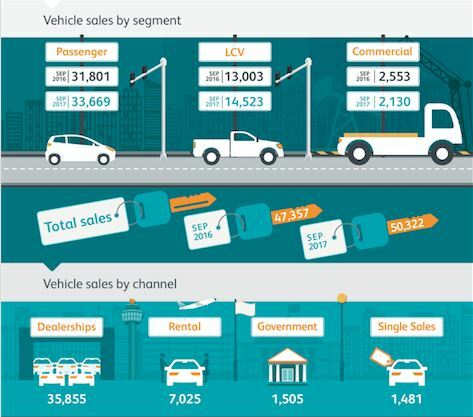 Compared to the previous month, September’s average new vehicle finance transaction value was 1.1% lower: a clear indication that manufacturers are giving so much back to the consumer to the extent that the average transaction value has come down. Conversely, the supply of quality used vehicles is drying up, which has resulted in continued price inflation. Used vehicle finance deal values have risen 8.4%, year-on-year, and show no real signs of slowing down – climbing 2.5% in just the last three months.